FMCG manufacturers that want to convert more households around the world into loyal customers must compete with established and often dominant local brands. Kantar Worldpanel’s Brand Footprint study highlights that local brands are growing their footprints almost twice as fast as global brands*, with an average annual growth rate of 2%, compared with 1.2% for global brands. Local brands account for 60% of global FMCG shopping choices and were chosen 129 billion times last year. In Taiwan, the influence of local brands are apparent, with only one international brand making the top 10 ranking, and Uni-President sitting at number one for second consecutive year. Uni-President was chosen 44.6 million times by Taiwanese consumers in 2013, despite it being a 5.7% YoY decline due to the food safety issue last year, the brand’s extensive product offerings and long terms brand equity was able to help sustain its leading position. Other than Taiwan, Asia countries including China, Philippines and Thailand are also showing similar trend, reflecting the difficulties global brands are facing in local battle fields. For the 2013 ranking, brands that entered top 10 are no different than the previous year. Other than Uni-President remaining number one, I-Mei and Kuang-Chuan also solidified their positions in second and third. 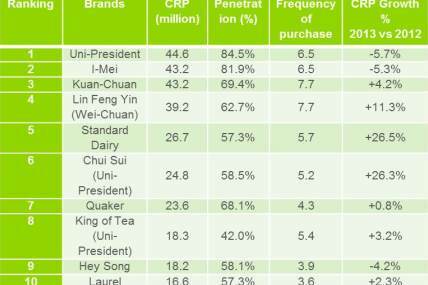 Furthermore due to the growing health conscious, the Brand Footprint has observed increase in demand for related categories such a dairy, which is reflected in the rankings, with dairy brands including Chui Sui, AB, LP33, Standard Dairy and Lin Feng Yin all showing growth in their rankings. However some global brands still stand out. Coca-Cola, which remains the world’s most chosen brand for the second year, was chosen more than 5.8 billion times in the last year. The beverages manufacturer was chosen an additional 124 million times in the last year (a growth of 2% which came mainly from Latin America). The world’s favourite biscuit brand Oreo added the most new buyers – 19 million in the last year – equivalent to the total number of households in the Philippines, thanks to its growing presence in China. While Coca Cola and Oreo performed strong on global basis, in Taiwan it still faced challenges from local competition, with both brands seeing decline in CRP in the Taiwanese market. Yvonne Wang, General Manager of Kantar Worldpanel Taiwan says: “The fundamentals to growing a brand is more buyers and greater occasions, therefore how to create new shopping occasions is an essential factor for sales and marketing to consider. The Brand Footprint report highlights the opportunities that exist for every brand with global aspirations to expand its consumer base and it provides an essential guide for FMCG manufacturers to increase the dominance of their brands in the market. Asia drives growth for global FMCG brands, yet local brands continue to dominate - In the last year 83% of the 3.6 billion additional purchases made by households around the world were from Asia (a growth of 2.9% on the previous year). China, India and Indonesia are the biggest contributors of global growth. Local brands lead in Asia, capturing more than two thirds (69%) of all shopping decisions and growing their reach by 3.1% in the last year compared to global brands which grew by 2.6% in the region. Polarisation between luxury/premium and value – while shoppers remain cautious after a long period of economic gloom they are also upgrading to premium or luxury product options across many categories. In Europe and the US they are tired of having to make their budget go further and want a treat. Asian shoppers are trading up because they can and want to have what’s best for their families as the number of middle class consumers increases. TRESemmé grew its global footprint by 10% (adding 9 million households in the last year) by bringing supermarket shoppers ‘salon quality’ hair care products. Desire for a healthier lifestyle – as global and Asian middle classes expand, consumers are more aware and have more money to spend on their health and wellbeing. Many food and drink brands in Asia are leveraging the consumer desire for a healthier lifestyle introducing products with added health benefits and functions. Priobiotic drinks brand Yakult for example (No 35 in Asian regional ranking) is now purchased by 59 million households in Asia. It offers products that contribute to good health at a price everyone can afford. In Taiwan, similar trends was observed, with consumers more willing invest in high-end products to better take care of themselves, with brands related categories including fresh milk, health food supplement and oral care all seeing growth, including Quaker, Colgate and Oral-B. Ready to drink tea is the fastest growing FMCG category – It added 15 million new shoppers last year, a growth of 12%. 2013 Taiwan’s FMCG CRP growth of 5% was benefited from a strong beverage market, with fresh milk the fastest growing category. 16 billionaire club brands ─ 16 Global brands has been purchased more than a billion times in 2013, including Coca Cola, Colgate, Nescafe, Maggi, Pepsi, Knorr, Lifebuoy, Lay’s, Pantene, Kraft, Dove, Palmolive, Lux, Nestle, Tide and Surf. Master Kong No.1 in China’s ranking – Master Kong is the only brand in China with more than 90% buyer penetration. Want Want ranked 4th place, and Uni-President made it into top 10, sitting in 6th place. Indonesia is a rising star– Indonesia is stepping out as a must-win market for the next wave of international growth. Indonesia’s economy will surpass Germany by 2030 and during the same period of time the country will bring 80 million new consumers. *Definition of global brands refers to consumers brands that are sold in at least two continents worldwide.